First impressions are everything. Do you know what your new hires think about the company, their team, or the training they received during their initial time at your company? Do you even know if newbies are being set up for success in their roles? Chances are good there's room for improvement, but you need to collect that feedback from employees before you can even begin to make changes. But don't worry, pulse surveys with TINYpulse Onboard have you covered. (i) You must have Admin or Super Admin permissions in Engage in order to invite new hires to TINYpulse. Triggering TINYpulse Onboard questions is easy. 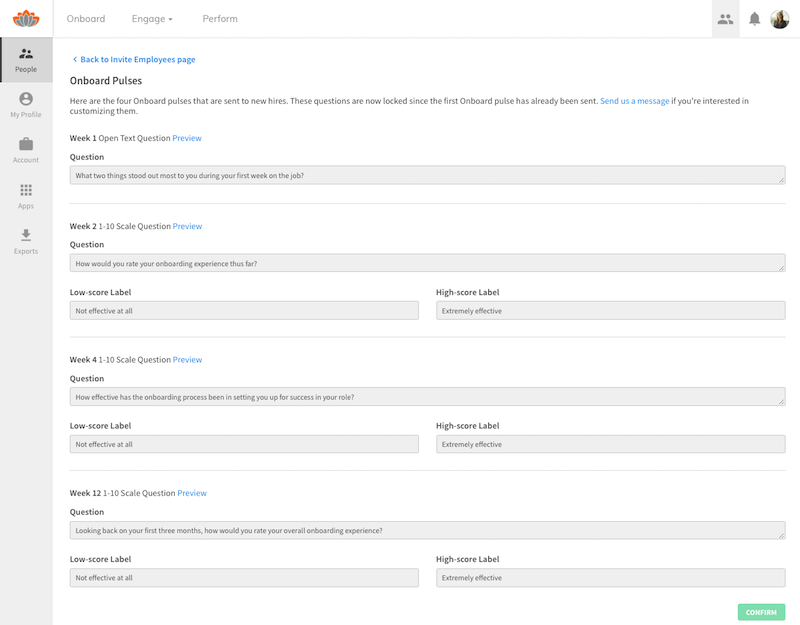 Just be sure to keep the Onboard checkbox selected when inviting employees to TINYpulse and we'll send them the right question. 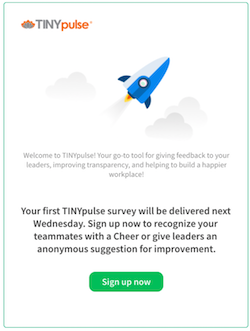 Employees will then get an invitation email and have immediate access to log into TINYpulse and start sending Cheers and anonymous suggestions, as well as voting and commenting if you have LIVEpulse features enabled. Keep reading for more information about the timing of these emails and notifications. The Onboard surveys are sent out after the new hire's first, second, fourth, and twelfth weeks on the job. Pulses follow the same schedule as Engage in that they are sent out at 10:00am on Wednesdays based on your organization's timezone. Surveys are open for one week each, and reminders are sent on the following Monday at 10:00am. A start date in the future: Employees will receive a welcome email at 10:00am on their start date and their first survey the Wednesday at least one week passed their start date. So go on and add users to TINYpulse the moment you know they're coming on board! We'll take care of sending the right emails at the right time so there's no need to wait until their start date has passed. A start date in the past: These employees will receive a "Welcome to TINYpulse" email within an hour from when they were added to TINYpulse, and their first survey will be delivered the next Wednesday. Take note of the First Survey date on the confirmation page after employees are invited for the exact timing. No start date: Employees invited to TINYpulse without a start date will follow the same Onboard pulse schedule as those with a start date in the past: They'll get a "Welcome to TINYpulse" email within an hour, and their first survey the next Wednesday. There are some intricacies to the pulse schedule when you invite employees to TINYpulse with a start date that is the same as the day you've invited them, as well as employees who are invited without a start date. It's Friday and I invite a new user to TINYpulse with their start date listed for today or without a start date. They'll get a Welcome email within the hour and their first Onboard pulse the very next Wednesday. It's Monday and I invite a new user to TINYpulse with the start date listed for today or without a start date. They'll get a Welcome email within the hour and their first Onboard pulse a week and a half later on their second Wednesday on the job. During the first five weeks at your organization, new hires will only receive Onboard questions. They will not get the primary Engage question until after the Week 4 Onboard question has closed, although they can still access the LIVEpulse suggestions feed, and send Cheers and give anonymous suggestions. This is designed to "keep it TINY" and avoid confusion so employees aren't bombarded with multiple surveys at the same time. There is a seamless transition between Onboard and Engage surveys to allow employees a unified experience for giving their feedback. Week 1 (open text response): What two things stood out most to you during your first week on the job? Week 2 (scale 1-10 + open text response): How would you rate your onboarding experience thus far? Week 4 (scale 1-10 + open text response): How effective has the onboarding process been in setting you up for success in your role? Week 12 (scale 1-10 + open text response): Looking back on your first three months, how would you rate your overall onboarding experience? Click here to learn how to customize Onboard pulses. 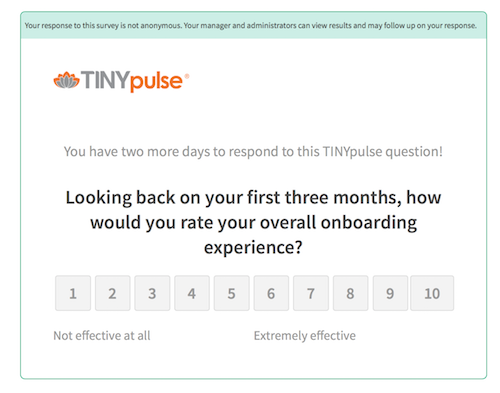 If you've invited users to TINYpulse with the Onboard checkbox selected, they'll receive Onboard pulses automatically and won't get an Engage question until their sixth week at your organization. If an employee is set to receive Onboard pulses and you decide that you want them only to receive Engage questions instead, you can make that change in the employee's profile. Just go to Settings by clicking the people icon in the upper right navigation, find the employee in the user list, click on their name to open their profile, and click Skip Onboard Surveys. Now, this employee won't get any (more) Onboard pulses and they'll only receive anonymous Engage questions going forward.